Cracked chlorella in powder form. 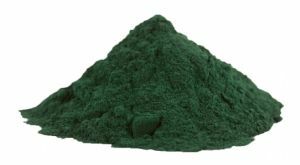 Chlorella is a unicellular, non-reproductive fresh water algae which perfected itself around 540 million years ago and has remained the same ever since. In the past, chlorella has been researched as a space food and scientists even thought that by now we’d all be eating it in burger form. Sadly, it turned out that production was a little more difficult than previously thought. This has not however, stopped it from gaining new prominence among health food buffs.